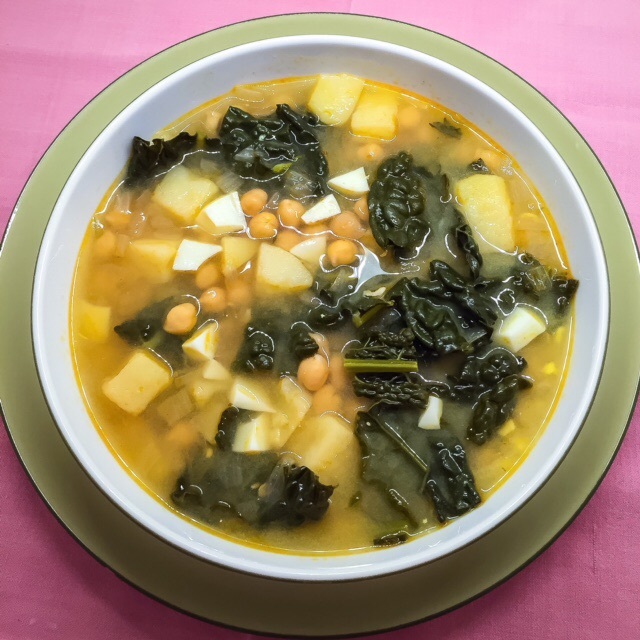 This is really very similar to my Chickpea and Spinach soup, however this one is completely vegetarian. I often do make the other one without the Chorizo, but I wanted to make one specifically without chorizo and which still had that same depth of flavour. Changing around the spinach for Cavalo Nero Kale was a great way to do this. It gives it an earthiness which is strong enough to support the smoked paprika, which would have been lost without the chorizo. I have also included some potato which is more traditional of the original dish from Spain. This makes it more like a stew or hotpot rather than a soup. And, as per the other dish, I have included the egg. This is completely optional to your tastes or dietary considerations, but it does give it a creaminess which would be missing otherwise. In a large saucepan, saute the chopped onion and garlic in a little oil until they are soft and starting to brown. Add the smoked paprika and stir over heat for another minute. Add the stock, chickpeas, kale and potatoes. Bring to a boil and simmer for 30 mins, checking after 20 to see if the potatoes are cooked. If you are using the egg, cut them in half and remove the yolk. Using a little stock grind the cooked yolk and liquid into a smooth paste. Then add this into the soup and stir through. Chop the egg whites and add this to the soup. Heat through for another 10 minutes before serving. If you are not using the egg, check the chickpeas and potato after the 30 mins. When cooked through you may serve. The soup will keep in the fridge for up to 3 days. If you are using dried chickpeas, you will find they will increase in size by 2.5 to 3 times. Soak them overnight in plenty of fresh water. Then drain and cover with fresh water again, bring them to a boil and then simmer for about 40 minutes. The time will vary depending on your chickpeas. Drain and then add to the recipe above.